We had this bread every day for breakfast till it ran out. 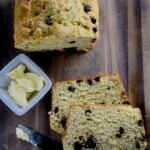 It is soft and moist like Banana bread and tastes heavenly with butter. 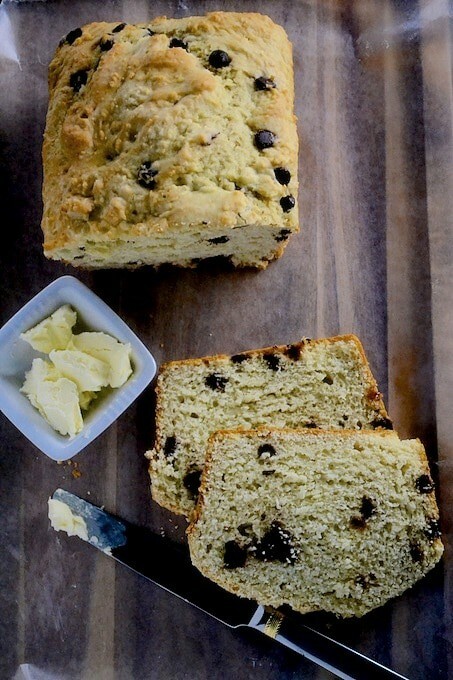 As far as the mix-ins for this bread is concerned, most people add raisins but us chocoholics went for semi-sweet chocolate morsels.I will always be eternally thankful to AllRecipes magazine for introducing me to this recipe. One last thing, the reason it is called Soda bread is because we use baking soda as the leavening agent instead of yeast. Go ahead and give this recipe a try! The only thing I would like to add is make sure your baking soda is not more than 6 months old. Preheat the oven at 350 degrees F.Grease a 9X5-inch loaf pan. Combine the dry ingredients (flour, salt, baking soda, baking powder, and sugar) in a bowl. Mix together buttermilk and egg till it combines and then add it to the flour mixture and mix it till the flour gets moistened. Add melted butter to this mixture and mix well. Pour the mixture to the greased pan. Place the pan in a pre-heated oven and bake it until a toothpick inserted into the center of the loaf comes out clean, around 60 - 65 minutes. Remove from the oven and let the bread cool in the pan for a few minutes and then turn out onto a wire rack to cool completely before serving.